Commitment is the allegiance that either you DO or you DON’T, there is no middle road. Interest in doing or achieving something occurs when it is convenient to us and if circumstances permit. However, commitment is when you accept no excuses, face the hardships, focus on the positives, understand the negatives and move forward with courage. With this type of determination towards your dreams and being so motivated, how can you fail? However, you have to make that pledge that you are all IN and there is no turning back so that your dreams can become your reality. Resistance – This is the dream killer stage where you focus on the negatives and what you CANNOT do. Reluctance – This is your wish stage. You have an idea but are hesitant to put it in practice. Existent – This is your hope stage. The dream is taking shape and there is some motivation. Compliant – This is your like and try stage. Where you are finally putting the work towards your dream and are motivated. You are excited to see the results and do the work. Committed – Now that you see some results and you feel good doing the work, you want your dreams to come true. Compelled – This is when your dream is your calling, your motivation is at its peak and your commitment is in full force. There is no turning back now! 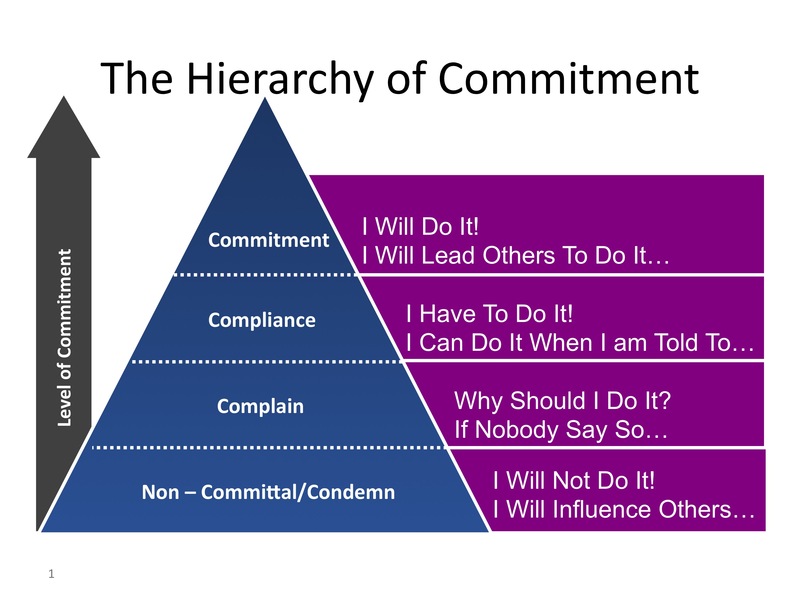 As you review, the commitment continuum scale, assess and analyze the stage that you are experiencing. If you are in the first two stages, quietly think about what is stopping you. The answer will come from within you and mostly is driven by fear. If you have arrived at the middle two stages, then ensure that you are motivated to keep performing. There is no room for complacency at this point. If you are positioned at the last two stages, then the work is natural and comes from within you. Don’t stop now! Moreover, if you fall back in the continuum, it is okay. Be kind to yourself and think about what changes you need to make to transform your dreams into reality. All of us fall, it is about how quickly we can dust ourselves off and move steadily and swiftly on our path by learning from those difficulties. As we partake in the celebration of Mother’s Day on Sunday, May 10, 2015, let’s honour these wonderful women who were committed in their goal(s) to give their children a better life, safe environments, a good education and values that make us better human beings. In return for their sacrifices, persistence and hard work, let’s take on the duty towards our dreams with the fuel of motivation and the framework of commitment.